Charlie Sheen has yet to learn that silence is golden. The controversial television star has been embroiled in numerous sagas in the past few months, many of which have involved drugs, alcohol and strippers. The father of five's fan favorite Two and a Half Men was suspended following his rants about the show's producer, Chuck Lorre, and the bad boy has now appeared on three national talk shows to discuss his well being. The worst part? 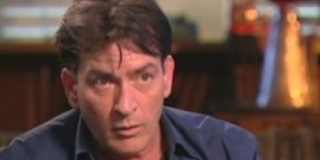 His publicist quit, putting the Charlie show at the top of Sheen's agenda. Let's hope he learns to shut his mouth soon. "Lead by example and teach your kids right and wrong. If my right and wrong is a little bit different than anybody else, then my kids will be different too." "I'm insulted, I am confused. These resentments, they are the rocket fuel that lives in the tip of my saber. You guys want to go to war, let's go to war. You want to destroy my family, let's go... When I'm declared winner, game over, I hope you are all writing your apologies." Note: Charlie is also demanding a public apology from CBS, as well as a 50 percent pay hike, to $3 million per episode, after the "psychological damage the network and Chuck Lorre caused him. "Well I would love that [to get my job back]. I signed a deal for two years. There was a redundancy factor to it but that doesn't matter. That was an old brain. I've got a new brain. You know, I have a 10,000 year old brain and the boogers of a seven-year-old." "Yes, I do [regret making what appeared to be an anti-Semitic dig at him]. I regret it in a way that I didn't even think about it, and then ya, I should have thought about it. It was stupid. A stupid move. I'm sorry. Well of course I would [say sorry to him], but I didn't think that was, that the rules had been established. He calls me Carlos Estevez a lot, because that's my real name, and then I saw the "other name" on his vanity card and I said it and the world started burning down around me." "As much as I love him, I'm 45 with five kids, you know. He's been out of the country I think, which is why he hasn't called. I think people think that it's [my life] a lot harder on me than people think. I'm on a quest to claim absolute victory across the board on every front in this whole mess. I'm here to right, as I said, every single wrong and reveal all of this foolishness.